Click on images for larger picture. Normally we see the moon illuminated from the other side. However, in the early morning this view awaits moon watchers. This image is a mosaic of 27 panels created from 16 sub-frames each (for a total of 432 shots). This image would have been nearly 140 MegaPixels had I chosen to process full frame shots. Instead I choose to process half sized images to keep myself sane. As it stands that still resulted in a 35MP image. Click on the image to see some larger versions and backdrop sized jpegs. The image data was taken 02 September 2007. The color differences between this image and the image below have much to do with the differences in the cameras used and processing. 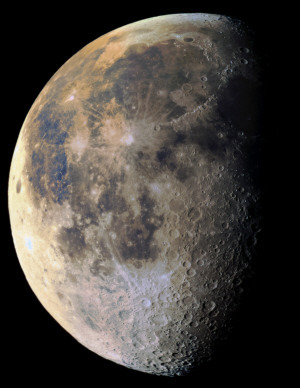 An image made from combining 216 "full frame" shots the evening of May 07th, 2006. 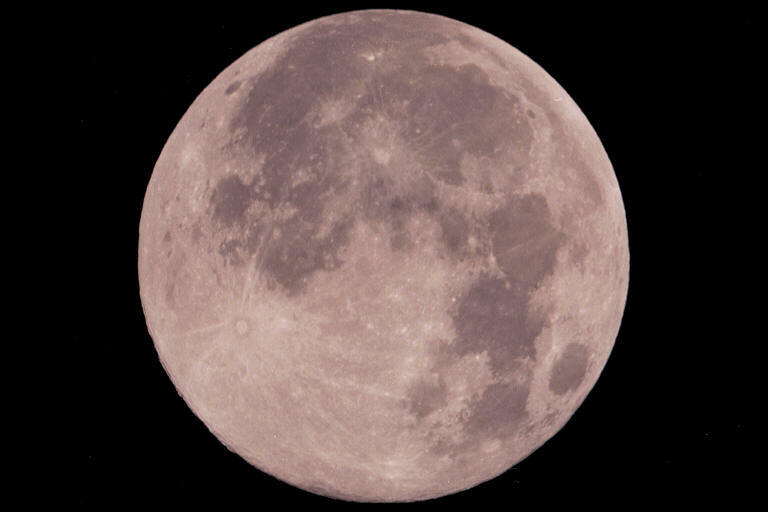 Taken at 2:48AM EDT (6:48 UT) August 15, 2003. This image was taken on the night of the great 2003 Eastern US Blackout. 22.97" in diameter. VirtualDub was used for image capture. 399 frames out of 1200. Click on the image for details. July 17, 2003 at 9:11UT. This is the best 512 frames out of 1200. 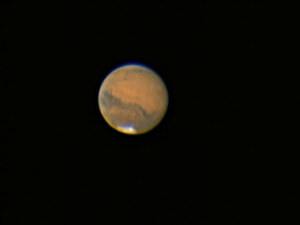 Mars is 19.62" in diameter. Click on the image for details. This image is a composite of 149 images captured from my Logitech QuickCam 4000 Pro. 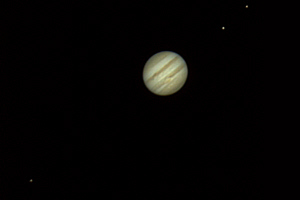 The images were processed using AVIedit and stacked using Registax. 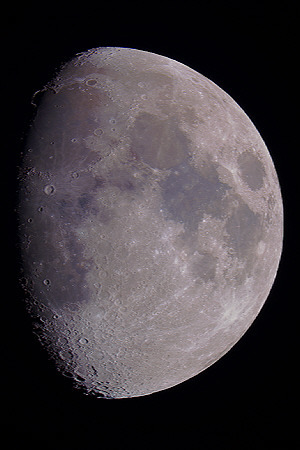 Taken February 9th, 2003 at 2600mm F.L. 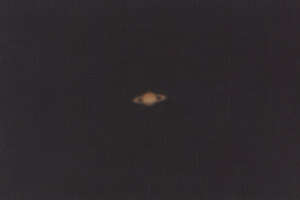 This is among my first attempts to use a webcam for planetary work. This image is a composite of over 1800(!) images captured from my Logitech QuickCam 4000 Pro. 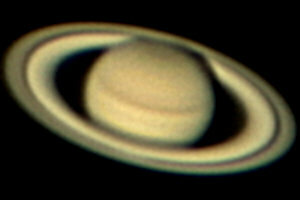 The images were processed using AVIedit and stacked using Registax. Taken February 7th, 2003 around 10pm EST. Approx. 2600mm F.L. This image is a composite of over 1000 images captured from my Logitech QuickCam 4000 Pro. The images were stacked using Registax. Taken February 7th, 2003 around 11pm EST. Approx. 2600mm F.L. M4, Mars, & Antares all got together in July 2001 in the awesomely beautiful Antares Region. 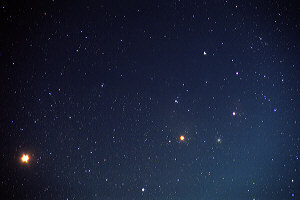 Mars is the bright "star" in the lower left corner, Antares is the second brightest star, and M4 is the smudgeball just to the right of Antares. 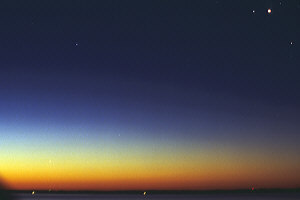 At the very beginning of twilight on July 14, 2001, Venus & Saturn made this awesome seen. The Pleides also help to round out the image. Click here or the image for a better view. . Kodak Supra 400 film. 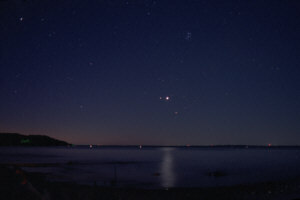 Before sunrise on July 14, 2001, five planets were in position to be placed in the same frame of my camera. Four of the five planets are Venus, Saturn, Jupiter, and Mercury. Can you guess the 5th? If not click here or the image. Also visible are some stars in that region of the sky, including Albebaran and Elnath. Kodak E200 slide film. Taken on December 18, 1999, I was very pleased with the outcome of this shot, in fact, I had 12 or so excellent shots just like this one with slightly different exposures and choosing the "winner" was really tough. Captured on Kodak E100VS and pushed one stop. Taken using my LX6 with f/6.3 focal reducer. Exposure time was 1/125 of a second. 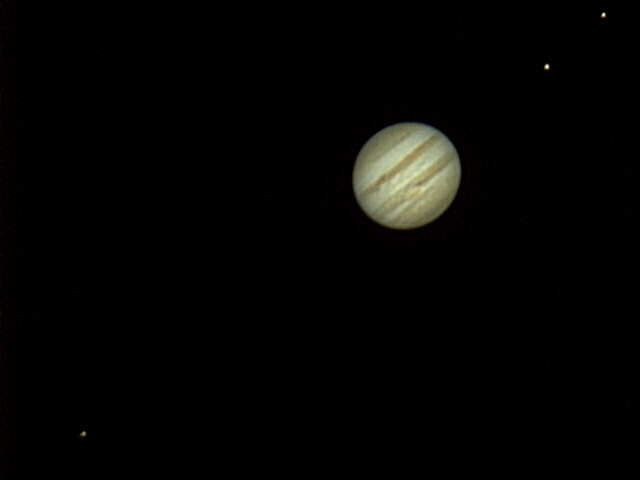 This image was taken with the same exact setup as the Jupiter image just below, of course if I had to do it over again, I would go for a 2 to 4 second exposure. 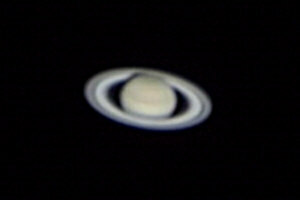 Still, there is some cloud detail and even a hint of detail in the rings. 1 second exposure on Kodak E100VS push processed one stop. 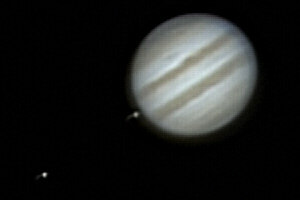 This was an eyepiece projection using my 10' LX6 and a Meade 9.7mm Superplossl with about 90mm of extention. 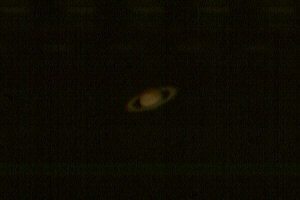 Also see my first Saturn astrophoto further down the page. 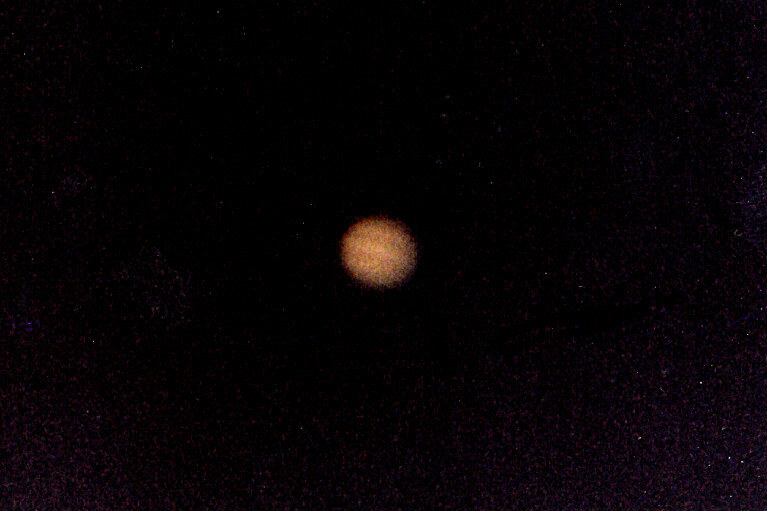 This image does a fairly good job of showning what Jupiter actually looked like through the eyepiece that night (December 18, 1999). While I have seen much better views then this they are very rare in my area due to astmosphereic turbulence. Overall though, I was pleased with the outcome. 1 second exposure on Kodak E100VS push processed one stop. 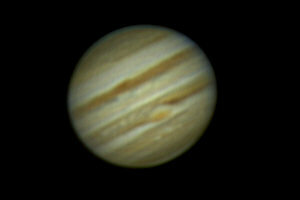 This was an eyepiece projection using my 10' LX6 and a Meade 9.7mm Superplossl with about 90mm of extention. 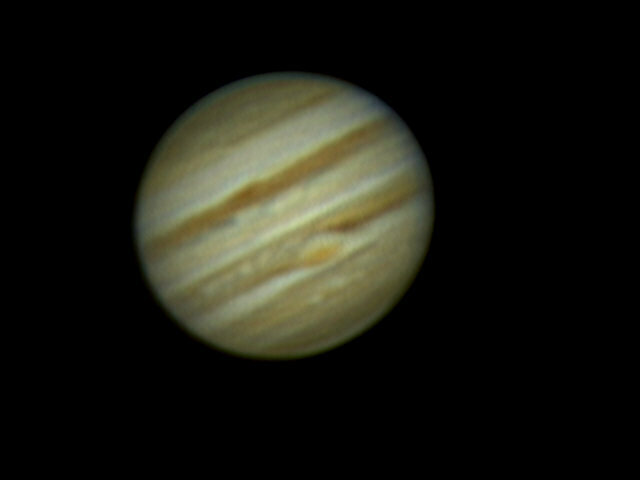 Please compare this to my first Jupiter photo below. ...But I did take this one! I captured this image from a low flying space craft that I was in at the time. It was only flying about 7 miles high near Winslow, AZ. 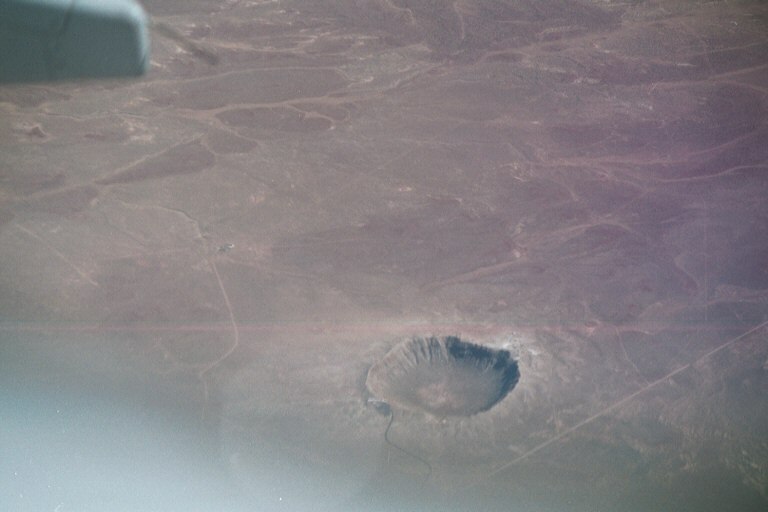 Look here for more information about Meteor Crater. Photo taken with my trust X-700 and 28-105 zoom at 35000 feet and 550 MPH. 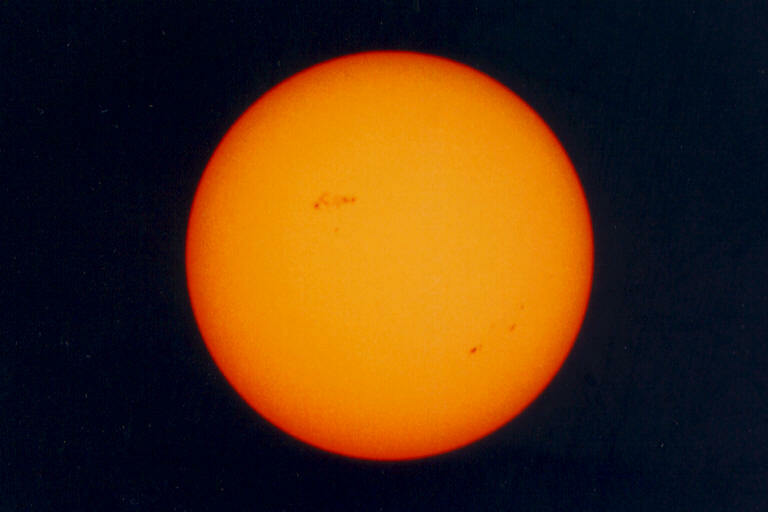 Taken August 1 1999 at 2:00 pm from New Buffalo, Michigan. This is a 1/125 sec exposure on Kodak PJ400 with Minolta SRT-102 at prime focus on my Meade ETX 90EC with a Meade f6.3 focal reducer (yielding an effective focal length of about 790mm). A Thousand Oaks type 2+ filter was used. This image was scanned from a 4 x 6 inch print & cropped. This was one frame of nearly 100 practice shots I took to dial in my setup for a trip to Austria to observe the 1999 Total Solar Eclipse. Click here for a listing of eclipse times and towns in Austria. This image was taken on 24 Noverber 1998 was my first ever attempt to photograph another planet. 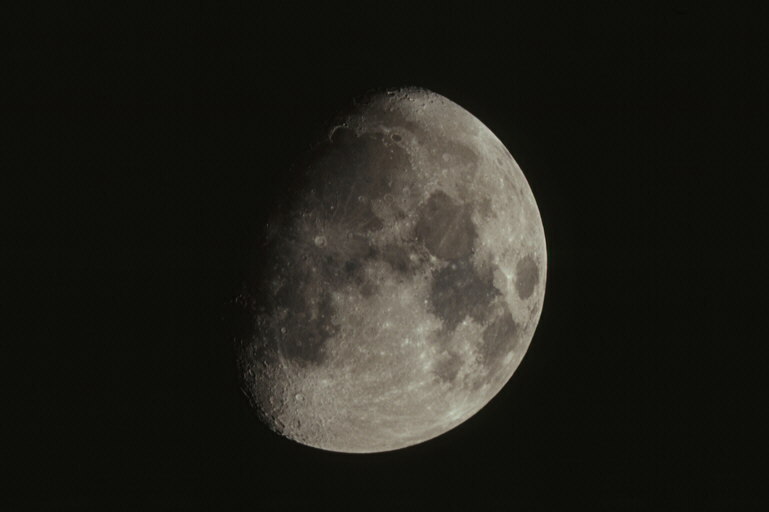 Taken with a 10" f/10 Meade LX6 with two 2x teleconverters with a Minolta SRT-102 for an effective focal length of 10000mm @ f/40. Exposure was 1/2 sec on Kodak Ektapress Multi-Speed (PJM-2). Not bad for a first try! 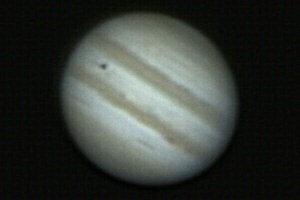 This image was taken on 24 Noverber 1998 was one of my first ever attempts to photograph another planet. 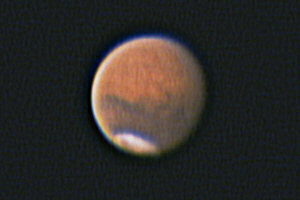 Taken with a 10" f/10 Meade LX6 with two 2x teleconverters with a Minolta SRT-102 for an effective focal length of 10000mm @ f/40. Exposure was 1/8 sec on Kodak Ektapress Multi-Speed (PJM-2). Not as good as the Saturn effort. This image of the full moon was taken on 11 April 1998. 10" f/10 Meade LX6 at prime focus with a Minolta SRT-102. Exposure was 1/125 sec on Kodak Ektapress Multi-Speed (PJM-2). Finally this image was scanned using my HP Photosmart scanner. O.K.! O.K.! So I didn't take this one! But here is what NASA had to say about it. "This is an Apollo 17 hand-held Hasselblad picture of the full Earth. This picture was taken on 7 December 1972, as the spacecraft traveled to the moon, the last of the Apollo missions. A remarkably cloud-free Africa is at upper left, stretching down to the center of the image. Saudi Arabia is visible at the top of the disk and Antarctica and the south pole are at the bottom. Asia is on the horizon is at upper right. 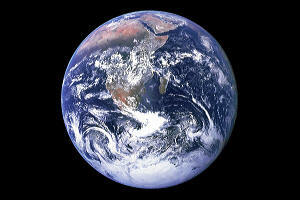 The Earth is 12,740 km in diameter. (Apollo 17, AS17-148-22725)."